The four students had spent the morning in the kitchen slicing tomatoes, plantains and pineapple for braised chicken estofado. They had steeped spices for chai and prepped for the week's lunches at Ubuntu Street Café in Kent, south of Seattle. But now the black chef jackets are off. The women huddle around a table in the neighboring office, scribbling on post-it notes and dissecting a string of tasks. "You all want to have your own businesses," says Veena Prasad, encouraging the apprentices as she guides them through breaking down lists into individual to-do's - a helpful skill for ordering supplies or setting up a catering event. "Organizing, at the end of the day, is about money. It counts, whether you're dealing with tortas or diamonds." Prasad has a wealth of leadership experience to share. Years of working as an engineer and project manager for Procter & Gamble honed her organizational skills and gave her experience managing diverse teams from around the world. Launching her own Indian recipe-kit venture taught her the nuances of starting a food business. And now as founder of Project Feast, the nonprofit behind the Ubuntu Street Café apprenticeship, Prasad is leveraging her talents to create a big impact out of a small amount of seed money. "It's so important that we don't just look at people of color as dishwashers or prep cooks, but that we start seeing leadership roles in them." Since 2013, Project Feast has helped dozens of refugees and immigrants gain skills so they can find good jobs in the culinary world - a mission that combines Prasad's entrepreneurial instincts with her passion for connecting people through the universal experience of food. Most of the students have moved on to work in the local food industry, and several now run their own businesses. Leadership development - equipping students to run a kitchen or their own business - is an essential ingredient in Project Feast's mission. "It's so important that we don't just look at people of color as dishwashers or prep cooks, but that we start seeing leadership roles in them," Prasad says. "So much of the food industry is run on the backs of people of color who don't make it up into the hierarchy. In the next 20 years, I would love to be a part of helping to change that." Prasad knows first-hand the importance of food in the immigrant experience. She came to the U.S. as a teen with her family from Bangalore, India, but she didn't appreciate cooking Indian food until her late 20s while working for Procter & Gamble and living in Germany. "For me, food was a way to connect with my roots," she says. "I think this is integral to first-generation immigrant experiences. Initially, it's about needing to fit in, get an education or get a job in your new home. I ended up giving up some of my 'Indian-ness.' Cooking Indian food as an adult was my way to reaffirm who I was." 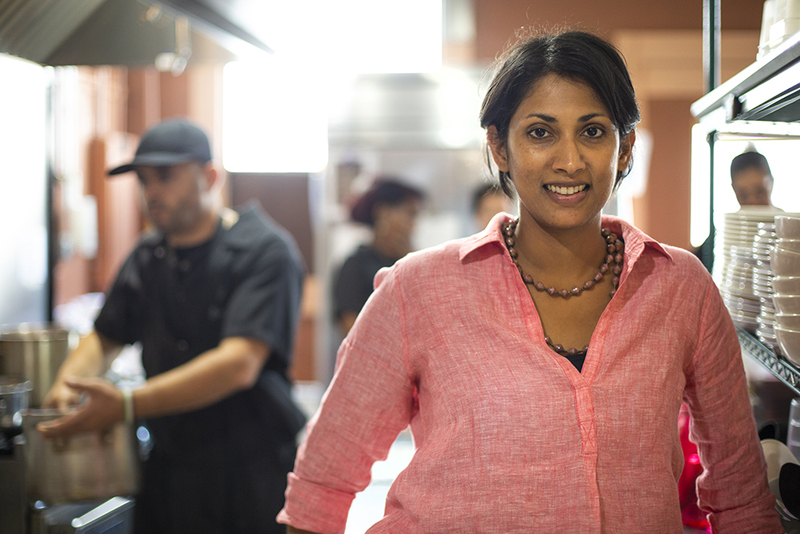 Veena Prasad, founder and executive director of Project Feast, photographed inside the kitchen of Ubuntu Street Cafe in Kent, Washington. In travels around the world, she realized she made stronger connections with people when food was involved. While taking Spanish-language classes in Guatemala, the teacher took her home and taught her to make some local dishes. Prasad came back to the Seattle area inspired: "That whole experience strengthened my resolve to do something entrepreneurial, and I decided to do it with food. It gave me a better understanding of what it means to your identity to cook food from your country, to keep that alive." She first created Veena's Market, selling kits with ingredients for Indian dishes. While she enjoyed the recipe development and creative challenges of launching a new business, she longed to work with a team again and have tangible, positive impact in her work. "I was really grappling with how could I do something that was meaningful - in addition to enjoying it," she says. "Initially, it's about needing to fit in, get an education or get a job in your new home. I ended up giving up some of my 'Indian-ness.' Cooking Indian food as an adult was my way to reaffirm who I was." In the first iteration of Project Feast, launched with a few volunteers and $3,000 of her own money, Prasad initially focused on the basics: helping immigrants navigate the process to get food-handler's permits. "I remember being surprised by the barriers that people had just to get their food-worker card," Prasad says. "It was just $10 and you could do it online. But many people didn't have credit cards or didn't feel comfortable accessing something online." Abezu Gedamu, center, tests the flavor of a batch of chai tea with Laurel Grimm, coordinator of the apprenticeship program at Project Feast. She and the volunteers developed a catering service that gave students experience while raising money for the program. In 2013 Prasad made a winning pitch to Social Venture Partners, a philanthropy that invests in innovative social programs, and the infusion of cash allowed Project Feast to extend the culinary skills training to weeks-long programs. Within four years, Prasad had developed partnerships with groups like the Food Innovation Network and Highline College in nearby Des Moines, Washington, to launch "Project Feast 2.0" - the Ubuntu Street Café and the 18-credit apprenticeship program that operates it. Since the formal apprenticeship began in 2017, seventeen students have graduated; most now work for food or hospitality businesses, or own their own. "We work with folks who are passionate about food and want to be in the industry," Prasad says. The small, but growing, Project Feast team listens to former students and their employers to fine-tune training. The apprenticeship was extended to 18 weeks as the staff realized the value of sustained hands-on experience in the café and its catering program. They worked with Highline College to shore up English and math instruction, and they incorporated recipe development to help students translate their own creations into dishes others can make. Apprentice Ofelia Anorve wrote the estofado recipe that was a café special for a few weeks. Originally from Guerrero, Anorve also makes dishes from her husband's native Oaxaca and enjoys exploring cuisine from all over Mexico. She's already started her own catering company, but says she needs the apprenticeship experience. "I need to learn more techniques," she says. "I need to be faster!" Left: Prasad shares a laugh with members of the apprenticeship program during a team lunch. Right: Laurel Grimm adds items to the menu board inside the cafe. The café menu also includes Ethiopian-style hummus, contributed by apprentice Abezu "Abbie" Gedamu. Gedamu doesn't use any tahini - but does add a lot of lime juice - and her bright version replaces a Syrian-style hummus created by a previous student. Gedamu hopes to open her own restaurant. Griselda Angeles of Mexico would like to work in a hotel restaurant, and Aster Weldesilassie, who has opened businesses in Kenya, aspires to run a hotel with a restaurant featuring Ethiopian and Italian cuisines. Nadezhda Mayster, whose Ukrainian "marriage salad" is a recent addition to the café menu, graduated in the apprenticeship's second cohort, and was hired on staff in the kitchen in 2018. "Project Feast has changed my life," she says, looking around the kitchen where current and former apprentices from around the world are prepping the week's lunches. "They teach me, and we teach each other." Teamwork is key in any smooth-running kitchen, but even more of an achievement in one that includes a wide range of language and cooking skills. 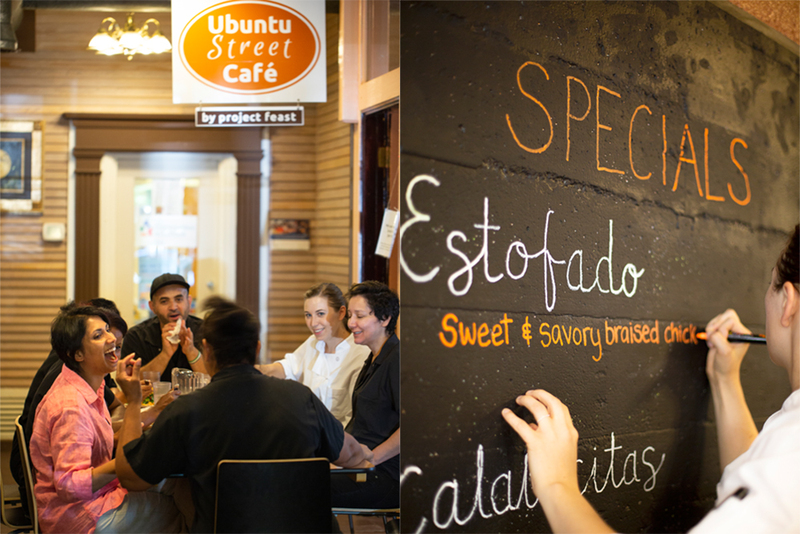 "Ubuntu, which means the bond of sharing, is the name of the café, but that doesn't happen naturally," Prasad says. She sees that commitment extend beyond the kitchen. "They think beyond their individual needs. They will ask, 'What can I do to help the community? What can I do to help Project Feast?'" As executive director, Prasad's biggest challenge is the nonprofit's lack of resources, requiring her to spend large chunks of time applying for grants and developing partnerships. In the world of grants, results are expected to track in a straight line - training leads to a specific number of jobs - but immigrants' employment paths are often circuitous, making the Project Feast story more complicated to tell. "It takes something like five years for a newly arrived immigrant to fully get on their feet," Prasad says. She describes the experience of one former student, who had been an accountant in Central Africa before coming to the U.S. His journey with Project Feast started in 2014. That training allowed him to eventually find work as a cook, which gave him the means to pursue an accounting degree. He will graduate in 2019. "When you run into someone who you know was struggling and a year or two has passed and now they're doing something amazing, it brings a jolt of joy," Prasad says. She hopes to help potential grantors recognize that there are many ways to track progress over time. "Growth happens in spurts. It's not linear," she says. Immigrants' employment paths are often circuitous, making the Project Feast story more complicated to tell. Prasad is also mindful that in order to help the apprentices and her organization grow, she must constantly grow as a leader. When one student was chronically late, Prasad realized that simply telling her to show up on time wasn't solving the problem. Prasad, a mother with young twins, recognized that child care challenges were a contributor, and the staff brainstormed with the student about how to change her morning routine to get to the café on time. "First, we strive to understand," Prasad says. "And if behavior isn't compatible with working in the food industry, we have to find a way to address that." "That's been my own biggest learning, helping someone get to the root of a problem," Prasad says. "I've gotten deeper into my leadership practice as a result." 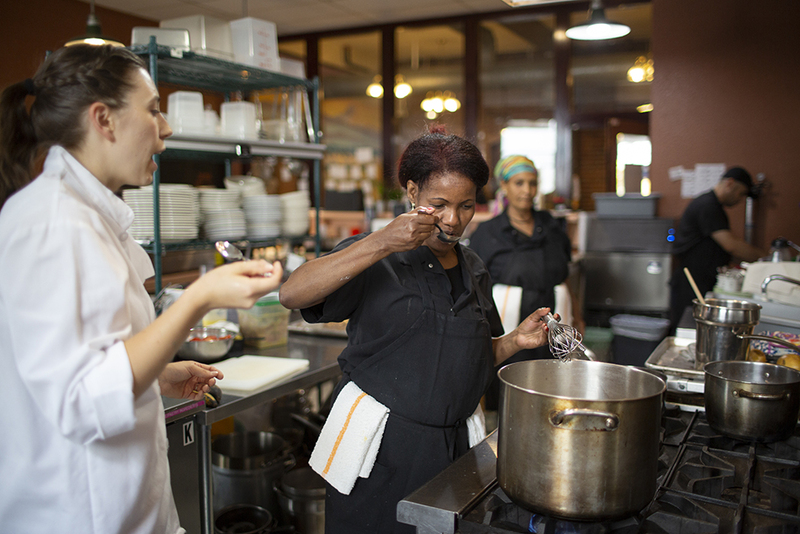 For Laurel Grimm, the program coordinator who handles culinary instruction, Prasad's approach has given her confidence as she leads her first kitchen team. "Veena and I do all of the leadership activities, too," she says, calling the weekly sessions grounding. "It's so easy in a kitchen to get frazzled. By being anchored in yourself, you can slow down in the kitchen and learn." "Project Feast has changed my life," she says, looking around the kitchen where current and former apprentices from around the world are prepping the week's lunches. "They teach me, and we teach each other." Prasad places a high value on hiring staff like Grimm who embrace development opportunities. "I'm not just looking for people who love to cook or who love refugees and immigrants," she says. "I'm looking for all of that, but I'm also looking for people who are willing to grow and help grow the organization." "If you want to make an impact, you have to be OK with growing yourself." Interested in working with Project Feast? Check out their current job opening. Denise Clifton is a writer based in Seattle. Her book, Tables From The Rubble, tells the story of San Francisco restaurants that arose in the recovery years after the 1906 earthquake.